The South East Cooperation Process Parliamentary Assembly (SEECP PA) is an entirely regional initiative, the result of a 20-year cooperation which demonstrates the sustainable interest of the participating parliaments in the search of mutual ways for development and synergies. 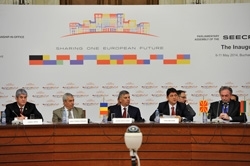 The Parliamentary Assembly of the SEECP was established in Bucharest in May 2014 following an extensive process of consultations aimed at transforming and further institutionalizing the SEECP Parliamentary Dimension. Its goals include both topics that relate directly to the SEE region, and topical issues in the area of European policies and European integration. SEECP PA geography covers the region of South East Europe, including EU member states, candidate countries and potential candidates. 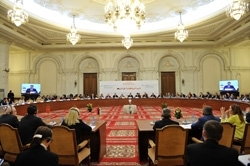 The SEECP Parliamentary Assembly is linked to the SEECP, as an international cooperation platform of states of the SEE region, but is separate from the SEECP governmental dimension. 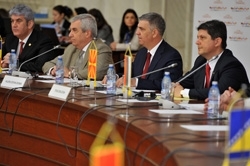 The unique nature of the SEECP PA is that it is a format initiated by the parliaments themselves. All these features make it an attractive institution with the potential to become a leading parliamentary platform for the region. - Intensification of the parliamentary diplomatic activities and establishing links with the regional, European and international organizations, institutions and foundations.